The University of Bologna (Italian: Università di Bologna, UNIBO), founded in 1088 by an organised guild of students (hence “studiorum”), is the oldest university in Europe,[ISBN missing] as well as one of the leading academic institutions in Italy and Europe. It is one of the most prestigious Italian universities, commonly ranking in the first places of national rankings. 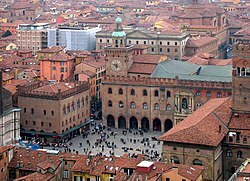 It was the first place of study to use the term universitas for the corporations of students and masters, which came to define the institution (especially its famous law school) located in Bologna, Italy. 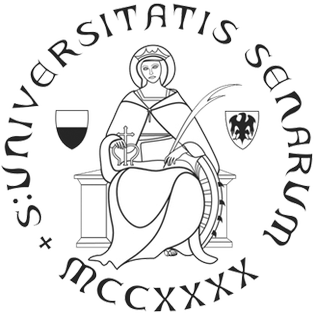 The University's crest carries the motto Alma mater studiorum ("nourishing mother of studies") and the date A.D. 1088, and it has about 86,500 students in its 11 schools. It has campuses in Ravenna, Forlì, Cesena and Rimini and a branch center abroad in Buenos Aires, Argentina. It also has a school of excellence named Collegio Superiore di Bologna. An associate publisher of the University of Bologna is Bononia University Press S.p.A. (BUP). The entry of some students in the Natio Germanica Bononiae, the nation of German students at Bologna; miniature of 1497. One of the earliest texts produced by the University and used by the rest of Europe in the Middle Ages was Roger Frugard’s Chirurgia published in 1180. The University arose around mutual aid societies (known as universitates scholarium) of foreign students called "nations" (as they were grouped by nationality) for protection against city laws which imposed collective punishment on foreigners for the crimes and debts of their countrymen. 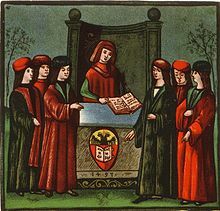 These students then hired scholars from the city's pre-existing lay and ecclesiastical schools to teach them subjects such as liberal arts, notarial law, theology, and ars dictaminis (scrivenery). The lectures were given in informal schools called scholae. In time the various universitates scholarium decided to form a larger association, or Studium—thus, the university. The Studium grew to have a strong position of collective bargaining with the city, since by then it derived significant revenue through visiting foreign students, who would depart if they were not well treated. The foreign students in Bologna received greater rights, and collective punishment was ended. There was also collective bargaining with the scholars who served as professors at the university. By the initiation or threat of a student strike, the students could enforce their demands as to the content of courses and the pay professors would receive. University professors were hired, fired, and had their pay determined by an elected council of two representatives from every student "nation" which governed the institution, with the most important decisions requiring a majority vote from all the students to ratify. The professors could also be fined if they failed to finish classes on time, or complete course material by the end of the semester. A student committee, the "Denouncers of Professors", kept tabs on them and reported any misbehavior. Professors themselves were not powerless, however, forming collegia doctorum (professors’ committees) in each faculty, and securing the rights to set examination fees and degree requirements. Eventually, the city ended this arrangement, paying professors from tax revenues and making it a chartered public university. The university is historically notable for its teaching of canon and civil law; indeed, it was set up in large part with the aim of studying the Digest, a central text in Roman law, which had been rediscovered in Italy in 1070, and the university was central in the development of medieval Roman law. Until modern times, the only degree granted at that university was the doctorate. Area above Bologna's old city centre. 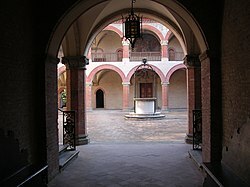 Interior view of the Porticum and Loggia of its oldest College, the Royal Spanish College. Higher education processes are being harmonised across the European Community. Nowadays the University offers 101 different "Laurea" or "Laurea breve" first-level degrees (three years of courses), followed by 108 "Laurea specialistica" or "Laurea magistrale" second-level degrees (two years). However, other 11 courses have maintained preceding rules of "Laurea specialistica a ciclo unico" or "Laurea magistrale a ciclo unico", with only one cycle of study of five years, except for medicine and dentistry which requires six years of courses. After the "Laurea" one may attain 1st level Master (one-year diploma, similar to a Postgraduate diploma). After second-level degrees are attained, one may proceed to 2nd level Master, specialisation schools (residency), or doctorates of research (PhD). The University is structured in 33 departments (there were 66 until 2012), organized by homogeneous research domains that integrate activities related to one or more Faculty. A new department of Latin History was added in 2015. In the early 1950s, some students of the University of Bologna were among the founders of the review "il Mulino". On 25 April 1951 the first issue of the review was published in Bologna. In a short time, "il Mulino" became one of the most interesting reference points in Italy for the political and cultural debate, and established important editorial relationships in Italy and abroad. Editorial activities evolved along with the review. In 1954, the il Mulino publishing house (Società editrice il Mulino) was founded, which today represents one of the most relevant Italian publishers. In addition to this were initiated research projects (focusing mostly on the educational institutions and the political system in Italy), that eventually led, in 1964, to the establishment of the Istituto Carlo Cattaneo. See: Serafino Mazzetti, Repertorio di tutti I professori antichi e moderni della famosa Università...di Bologna (Bologna 1848). The 2019 QS World University Rankings ranked the University of Bologna 180th in the world, as well as 77th (1st in Italy) with reference to "academic reputation". In the 2019 THE World University Rankings, the University of Bologna was ranked among the world's top 200 universities. 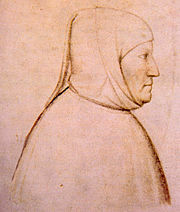 Wikimedia Commons has media related to University of Bologna. ^ "Censis, la classifica delle università: Bologna ancora prima". ^ a b Alma Mater superstar: stacca le concorrenti tra le mega università, by Ilaria Venturi. ^ "Europe - Ranking Web of Universities". www.webometrics.info. ^ "Schools". University of Bologna. Retrieved 22 December 2015. ^ "Campuses and Structures". University of Bologna. Retrieved 22 December 2015. ^ Paul L. Gaston (2012). The Challenge of Bologna: What United States Higher Education Has to Learn from Europe, and Why It Matters That We Learn It. Stylus Publishing, LLC. p. 18. ISBN 978-1-57922-502-5. ^ Paul F. Grendler, The Universities of the Italian Renaissance (JHU Press, 2002), 6. ^ David A. Lines, “The University and the City: Cultural Interactions”, in A Companion to Medieval and Renaissance Bologna, ed. Sarah Rubin Blanshei (Leiden: Brill, 2017), 437–8. ^ A University Built by the Invisible Hand, by Roderick T. Long. This article was published in the Spring 1994 issue of Formulations, by the Free Nation Foundation. ^ "University of Bologna | History & Development". Encyclopedia Britannica. Retrieved 2017-08-21. ^ Berman, Law and Revolution, ch. 3; Stein, Roman Law in European History, part 3. ^ "ARWU World University Rankings 2018 - Academic Ranking of World Universities 2017 - Top 500 universities - Shanghai Ranking - 2018". www.shanghairanking.com. ^ "QS World University Rankings 2018". topuniversities.com. 6 June 2018. ^ "World University Rankings". timeshighereducation.com. 26 September 2018. ^ "QS World University Rankings 2019". ^ "THE World University Rankings 2019". The University of Pisa is an Italian public research university located in Pisa, Italy. It was founded in 1343 by an edict of Pope Clement VI. It is the 19th oldest extant university in the world and the 10th oldest in Italy. The university is ranked within the top 10 nationally and the top 400 in the world according to the ARWU and the QS. It houses the Orto botanico di Pisa, Europe's oldest academic botanical garden, which was founded in 1544. The University of Milan, known colloquially as UniMi or Statale, is a higher education institution in Milan, Italy. It is one of the largest universities in Europe, with about 60,000 students, a permanent teaching and research staff of about 2,000. The University of Siena in Siena, Tuscany is one of the oldest and first publicly funded universities in Italy. Originally called Studium Senese, the institution was founded in 1240. It had around 20,000 students in 2006, nearly half of Siena's total population of around 54,000. Today, the University of Siena is best known for its Schools of Law, Medicine, and Economics and Management. The University of Genoa, known also with the acronym UniGe, is one of the largest universities in Italy. It is located in the city of Genoa and regional Metropolitan City of Genoa, on the Italian Riviera in the Liguria region of northwestern Italy. The original university was founded in 1481. Ca' Foscari University of Venice is a public university in Venice, Italy; it is usually known simply as Università Ca' Foscari. Since its foundation in 1868 it has been housed in the Venetian Gothic palace of Ca' Foscari, from which it takes its name. The palace stands on the Grand Canal, between the Rialto and San Marco, in the sestiere of Dorsoduro. Bocconi University is a private university in Milan, Italy. Bocconi provides undergraduate, graduate and post-graduate education in the fields of economics, management, finance, law, political science and public administration. SDA Bocconi, the university's business school, and offers MBA and Executive MBA programs. The Sapienza University of Rome, also called simply Sapienza or the University of Rome, is a collegiate research university located in Rome, Italy. Formally known as Università degli Studi di Roma "La Sapienza", it is one of the largest European universities by enrollments and one of the oldest in history, founded in 1303. The University is one of the most prestigious Italian universities, commonly ranking first in national rankings and in Southern Europe. The University of Modena and Reggio Emilia, located in Modena and Reggio Emilia, Emilia-Romagna, Italy, is one of the oldest and most prestigious universities in Italy, founded in 1175, with a population of 20,000 students. The University of Rome Tor Vergata, also known as the University of Rome II, is a public research university located in Rome, Italy. Its current president is Giuseppe Novelli, a professor in the Faculties of Medicine and Surgery. It was established in 1982 with the goal of providing high-quality education for students preparing to meet the ever-evolving needs and opportunities of the 21st-century workforce. Despite its young age, Tor Vergata has already reached high quality standards in Italy and Europe. Located in the south-eastern suburb of Rome, the university combines a liberal arts tradition with emphasis on career orientation in the field of Economics, Engineering, Sciences and Medicine. Many professors of the university are important members of the Italian cultural and political environment. Roma Tre University is an Italian public research university located in Rome, Italy, with its main campus situated in the Ostiense quarter. Università Cattolica del Sacro Cuore, known as UCSC or UNICATT or simply Cattolica, is an Italian private research university founded in 1921. Cattolica, with its five affiliated campuses, is the largest private university in Europe and the largest Catholic University in the world. Its main campus is located in Milan, Italy, with satellite campuses in Brescia, Piacenza, Cremona and Rome. Paris Universitas was an alliance of six institutions of higher education in Paris, France, that existed from 2005 to 2010. Paris Universitas offered a wide range of disciplines, from medicine to the humanities, engineering, law, management and the social sciences. The institution expected to rank between 1 and 3 in Europe for number of publications, although rankings were not released due to the short liffespan of the institution. In 2006, Paris Universitas was ranked first among European universities and 4th in the world for the largest volume of English-language publications.